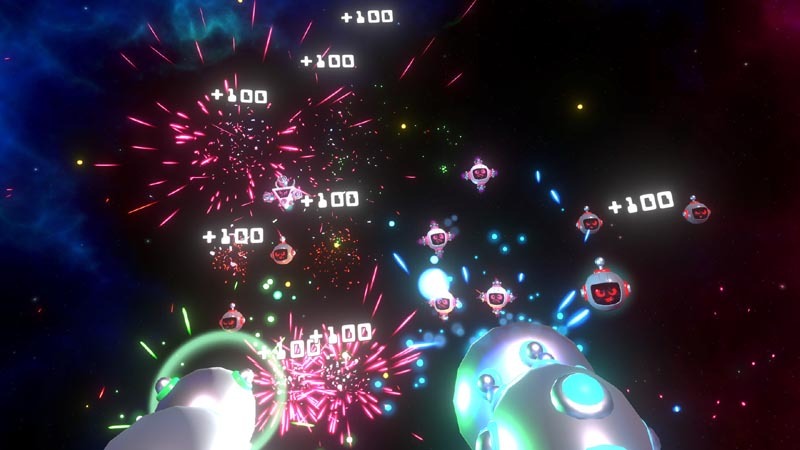 Mega Overload is a wave shooter with a twist: it plays like a VR Galaga. Waves of robots and UFO’s come down on you, raining bullets and danger as you move around avoiding their shots and blasting them out of the air. 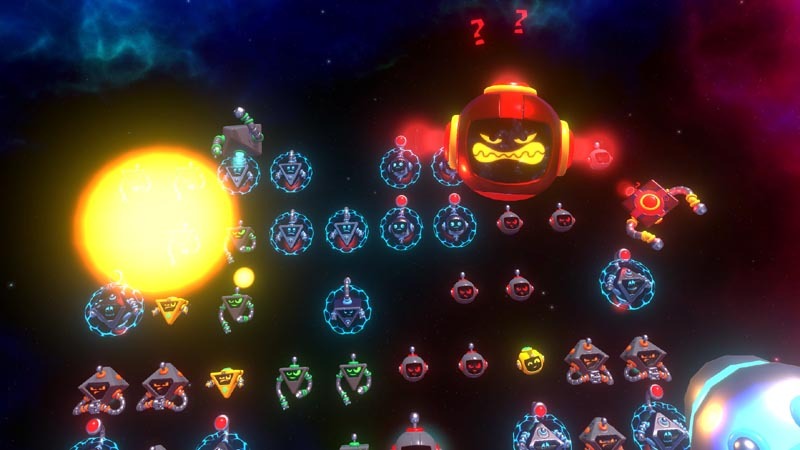 Mega Overload is a spaceport of fun, but is it just another wave shooter? The action gets pretty hectic! Visually the game would be right at home in a kid friendly VR arcade. Bright colors, and polished graphics make the game feel very wholesome, and the music is driving and really creates an arcade feel. That’s not to say the game is for kids however. Difficulty wise, similar to the first arcade games, there is a lot to master here. Enemies move surprisingly fast, and you will find yourself at the game over screen sooner than you may think. This leads to a large amount of replayability tin the game, especially when you factor in the random power-ups and gun upgrades you can get. Achievement hunters will be pleased to hear there are 20 achievements for the game, and a handful are truly difficult to obtain. I’ve played LOTS of wave shooters, but very few feel as fun to play as Mega Overload. That fun is doubled when you join a co-op game. The game is the same as single player, but you can blast away alien robots with a friend and compete to see who gets the higher score. Wave shooters, in my opinion, don’t leave lots to review. Either they are polished and fun, or they are fun for 30 minutes and then you never pick them back up. I can happily say Mega Overload is in the polished camp. My biggest complaint with Mega Overload is that, underneath the bright visuals, it’s still a wave shooter, albeit in a neat arcade wrapper. I would have liked to see a few more game modes here. Something like this with an Asteroid theme or a Centipede motif would greatly increase the replayability and enhance the overall package. Mega Overload is a fun VR take on an old arcade classic, but it is a few gamemodes short of being a staple VR title. What Would I Pay? I could see paying about $8 for Mega Overload, so picking this up on sale or in a bundle (which is not hard to find) definitely sets you up for a few hours of fun, especially if a friend has a copy as well. Also, has the giveaway ended yet?